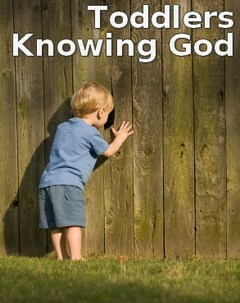 This is the second lesson plan in our series titled, “Toddlers Knowing God.” Each of these studies help children age 18-24 months better understand the character & nature of God. Click here to see the main index for these Bible lessons. This particular lesson is based on Psalm 18:1-2; 2 Samuel 22:33. In very simple language, it shows how God is our defenders and place of safety. Main Idea: God is our fortress. We run to Him, and He protects us. Supplies: Bible, picture of fortress. See additional activities for other supplies and preparation. SUPPLIES: Large cardboard box with cutout for door and windows. OR chairs, blankets, and pillows. SAY: I have made you a fortress. God is our fortress. We run to Him, and He protects us. DO: Have the children stand on one side of the room and instruct them to run to the fort. (If you have a large class and are using the box, you may need more than one so no one gets pushed out of the way. There needs to be plenty of space where they can run safely. If using the blankets and chairs, make it big enough to easily fit all of your toddlers.) Let them play in the fort , and repeat the main idea while they are playing. DO: Open the umbrellas for your toddlers. Demonstrate how umbrellas can protect you from rain by having one teacher squirt the other with the spray bottle. The teacher can protect themself by using the umbrella. Let the children have a turn using the umbrellas while you squirt them with small amounts of water. SAY: Umbrellas protect us from rain, just like a fortress can protect us. God is our fortress. We run to Him, and He keeps protects us. DO: Build a fortress out of blocks. SUPPLIES: A very large rock, one that is too large for them to lift. DO: Let them touch the rock. Discuss how it feels. SUPPLIES: Make a picture book with the words from Psalm 18:2 or 2 Samuel 22:33. Use the main idea for the last pages. DO: Read it to the children. SUPPLIES: Lots of pillows, enough to design a fun course (maze) for the children to follow through the room. DO: Show the toddlers how to walk through the course. Discuss how pillows feel. Hold hands or bow your heads together (just demonstrate and ask them to do the same. Some may, most may just watch.) Say a short prayer like the following: Dear God, you are our fortress. You protect us. Help us to run to you. We love you. Thank you for loving us. Amen. Tony Kummer (Editor) reviewed & updated this page on : February 26, 2019 at 6:11 pm. All our content is peer reviewed by our readers, simply leave a comment on any post suggest an update.